There are many benefits to cooking with a cast iron skillet or pan. They’re practical, easy to clean and a lot less destructible than normal pans. When seasoned properly, they are non-stick, and don't have chemicals such as PFTE or PFOA. 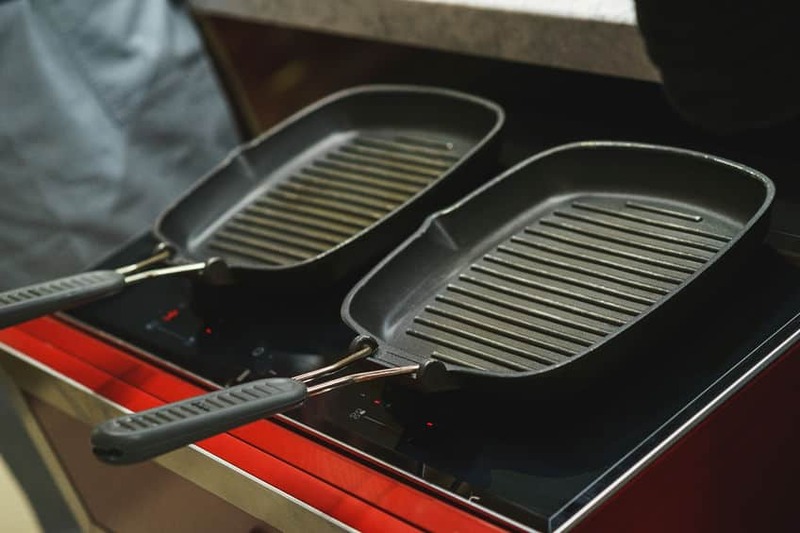 Cast iron can be used on all types of induction cookers, as well as on electric and gas cooktops. However, there is a lot to learn when it comes to cooking with cast iron. That’s why we have put together this short guide on everything you need to know about cooking with cast iron. We cover the basics from what cast iron is actually made from to why people cook with cast iron cookware. What is Cast Iron Made of? Why Should I Cook with Cast Iron? Cast iron is a mix of iron and carbon which can be molded and placed into a cast. It contains 2% carbon which is the main alloying element and 1-3% silicon. The melting temperature point is very low, making it a lot more useful than other metals. It is very rare that cookware made from cast iron will get damaged due to its high indestructibility. Generally, cast iron is made of iron and carbon but depending on the color of the cast iron when it is fractured, there is often a different amount of carbon and other chemicals in it. White cast iron has more carbide impurities than other cast irons. When it is fractured, white colored cracks are seen due to these impurities. Ductile cast iron has small amounts of magnesium added to the molten iron which reacts with oxygen and sulfur. This results in nodule-shaped (spherical) graphite particles. If a crack travels, it will meet a piece of this spherical graphite and the tip of the crack will be rounded. This stops the growth of the crack. Ductile cast iron is flexible and can be cast in various sizes and thicknesses. In contrast, the graphic flakes in grey cast iron have pointed ends which allow cracks to move through the metal. Gray cast iron is strong and has a high melting temperature. Typically, the type of cast iron that is used for cookware is malleable cast iron. This starts as white cast iron and then is heat treated for a few days and cooled for another few days resulting in the transformation of carbon into graphite and ferrite (also known as austenite). The cast iron is then cast and molded into the shape of cookware the factory is making. Despite the process being difficult and a lot of steps involved, the outcome is a very malleable and reliable piece of cookware which can be in a home for many years. 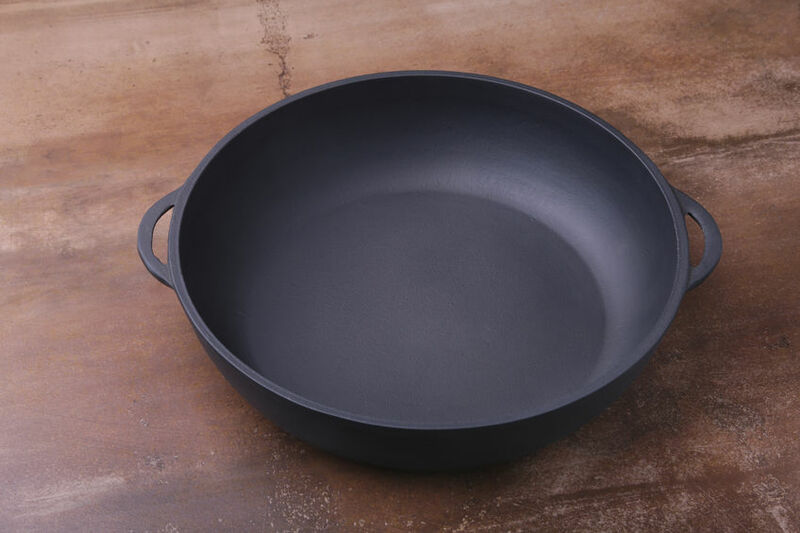 There are a lot of myths that claim it is difficult to clean and season cast iron cookware. However, it isn’t that hard to take care of, and the more you take the necessary steps to keep it in good condition, the longer it will last. There is a lot of discussion about seasoning cast iron cookware. Seasoning just refers to the layer of polymerized oil that has bonded with the cast iron cooking surface. The purpose is to have a slick surface so that food does not stick. It is a lot easier to cook with cast iron if the seasoning is protected. We have outlined the process for cleaning cast iron purchased new or at an estate sale is different from routine cleaning. 1. Line your sink with a towel so it doesn't get scratched. 2. Using a Brillo pad with soap or soap, water and a stiff bristle brush, scrub the inside, outside, and handle of pan. 3. Rinse with hot water. 4. Coat the inside and outside with a solid shortening. 5. Place upside down in oven on a foil lined cookie sheet or place foil on the lower rack and the pan upside down on the upper rack. 6. Heat at 350ºC for one hour. 7. Turn oven off. Take out when the oven has cooled. 1. Scrub with a nylon bristle scrub brush. 2. Rinse with hot water. Dry with a towel or paper towel. a. Sprinkle coarse kosher salt into the pan. b.Rub the salt into the stuck on food into the pan with paper towels. c. Add more salt as needed. d. Empty the salt and food out and wipe remnants away with paper towel. 4. Heat on low heat until dry (5-10 minutes) to remove remaining moisture. 5. Wipe pan when cool to remove remaining grease. 6. Store. Don't store pans with lid on them. The moisture in the air could become trapped resulting in rust. If you purchase a new or used bare cast iron vessel the first thing to do is to wash it and then season it. The purpose of seasoning is to get a non-stick coating on the pan's cooking surface that is natural. Lodge uses soy vegetable oil to season their cast iron products. Shortening or canola oil are also acceptable seasoning products. The following is the seasoning process recommended by Lodge. 1. Rub a small amount of cooking fat/oil into the pan. The purpose of this is to create a layer of fat that is bonded to the iron. 2. Place a piece of aluminum foil on the bottom rack of the oven. 3. Place the cast iron skillet face down on the upper oven rack. 4. Heat at 350ºC for one hour. 5. Turn off oven. Take out when oven is cooled. Repeat the process again another 2 or 3 times. The best thing about cooking with a cast iron is that it retains heat really well, so if you’re cooking something like a baked egg dish where the egg finishes cooking outside of the oven, it is ideal. Cast iron pans can also be used to make pan pizza, sear meat, fry eggs, and sauté vegetables. 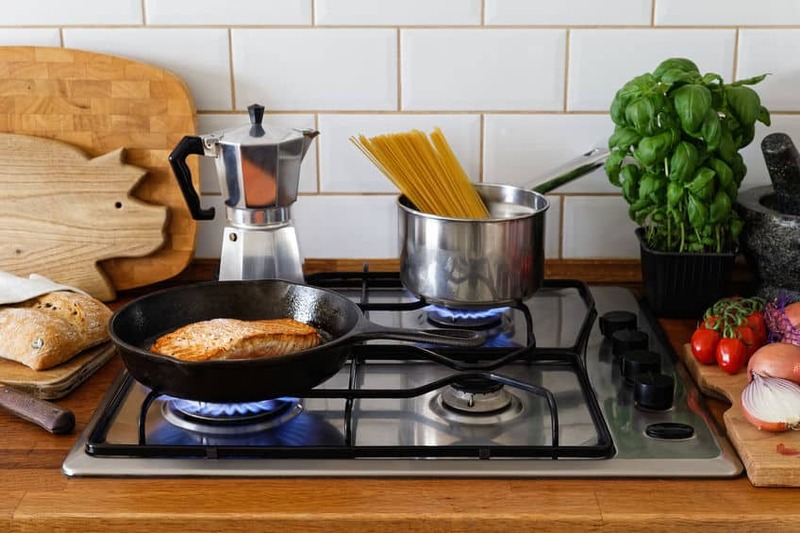 The cast iron skillet or pan can be moved from the stovetop straight into the oven without having to worry about ruining it. If you are concerned about the effects of coatings with chemicals such as PFTE, then cast iron is a good alternative for some recipes. Below we have listed pros and cons of cooking with a cast iron. They’re a non-stick surface if you look after them and ensure they don’t get rusty. 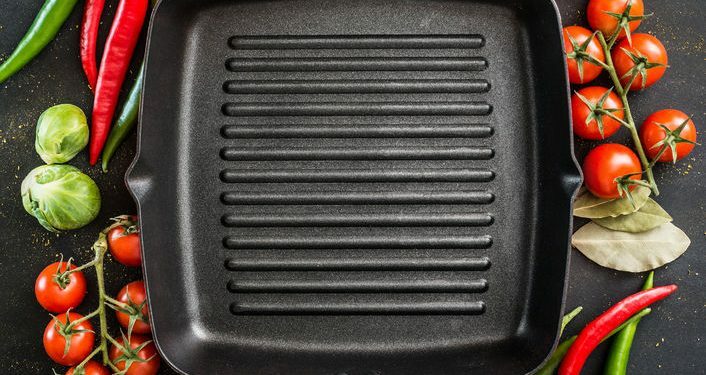 This non-stick surface isn’t chemical either which means you’re not putting any potentially harmful substances in your body just because of the pan. They stay hot for a while so it’s ideal if you’re cooking something for a long time. They can be used on top of the stove, in the oven or over a campfire. They put iron into your food and help to improve your iron levels so are particularly useful for people with an iron deficiency. Some foods absorb more iron than others. This depends on the cooking time, the amount of the food was stirred and how many times the food was turned. Since cast iron stays hot for awhile, care has to be taken and kept out of the reach of children. They require maintenance (season it properly, dry it completely after washing, and don't put a lid on it after drying) in order to ensure they don’t rust. One health benefit of cast iron is that if it is well-seasoned then less oil will be needed to prepare your food. Another advantage of using cast iron over nonstick cookware manufactured prior to 2013, is that it does not contain PFOA or PFTE. Perfluorooctanoic acid, which is also known as PFOA was one ingredient used in the manufacture of the liquid coating Teflon™. Dupont states they completed phasing out PFOA in 2013. The issue of whether or not PFOA is a cause of cancer continues to be debated. In February, 2017, Dupont and Chemours. (a spinoff from Dupont) settled a class action lawsuit involving the leak of PFOA into the water system in Parkersburg, WVa and contaminating the water supplies. It was alleged this leak was linked to six diseases including testicular and kidney cancers. If you have nonstick pans coated with Teflon™ prior to 2013, their use is worthy of research and consideration. Today, in cookware manufacturing plants that use Teflon™ brand nonstick coatings, the liquid coating used is supplied by Chemours. 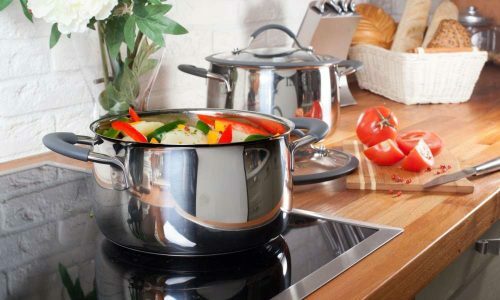 These nonstick coatings for cookware contain the PTFE (polytetrafluoroethylene). PFOA is no longer used by Chemours in the manufacture of PTFE. 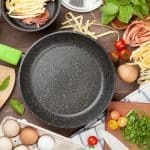 For those who are concerned that using cast iron might lead to iron toxicity, purchasing cast iron cookware that has a quality enamel layer is a viable option. 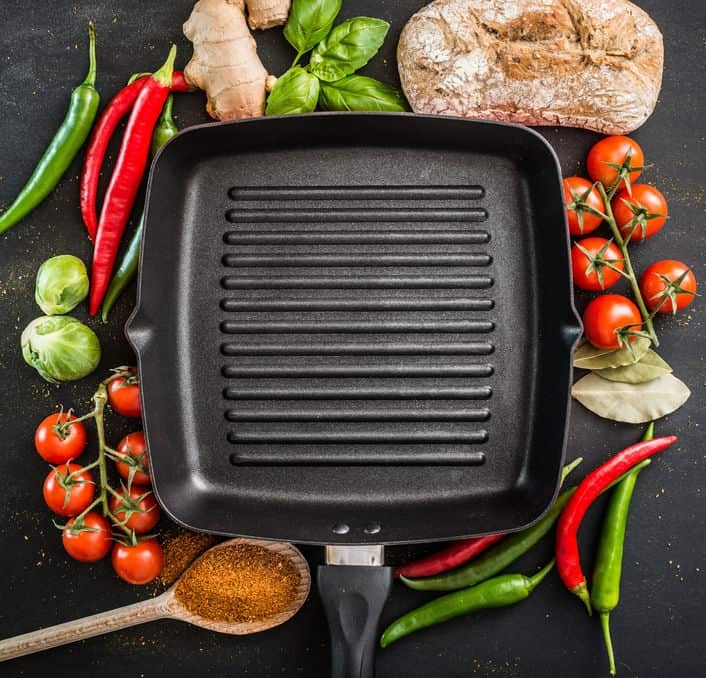 We recommend you stay away from cooking certain foods in cast iron skillets as it can not only ruin the way the food tastes (it will have a metallic taste), but it can often ruin the lining of the pan and cause the cookware to rust. These food items include acidic foods (tomato sauces or lemon-based ingredients), sticky foods (anything with a glaze on, as this, can cause the seasoning of the pan to get damaged), and delicate fish (as it can often overcook the fish and ruin the food for your meal). Some people have a cast iron skillet that is only used for preparing desserts. 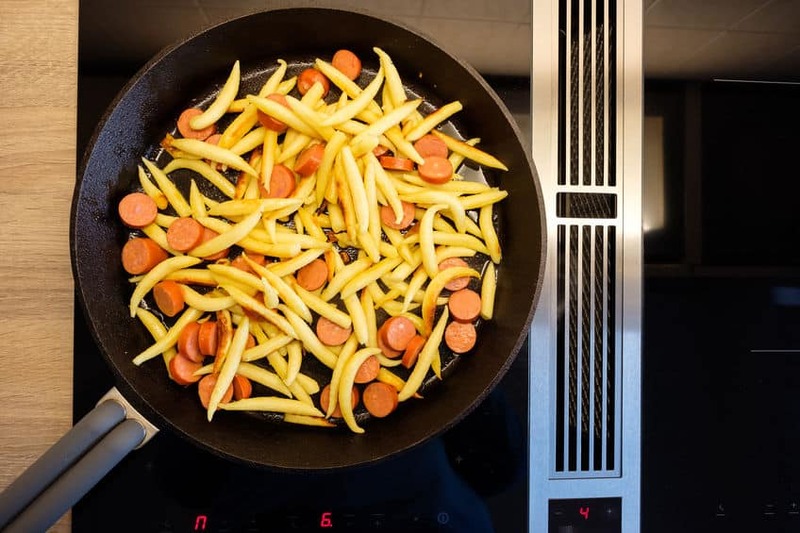 Their theory is that if a skillet is used to cook spicy foods and then used to prepare an apple pie for example, the residual flavors from the spicy food can transfer to the apple pie. Cooking with a cast iron is similar to frying, however, the pan can go in the oven afterward. 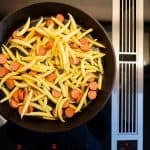 You can cook sauces in a cast iron skillet or pan then add your other ingredients such as meat or cheese and stick it in the oven to cook furthermore. You can also serve your dishes on the cast iron (but be aware as the food item will keep cooking and the pan will remain hot for a while. This is a neat idea for restaurants if they want to serve their steaks or other meats on a hot plate, they can use a cast iron skillet, pan, or piece of cookware.